2019 Giant Trance 29-2, the aluminum model, size XL, partial custom build. I need to sell one of my bikes, so I’m listing both (XL Ibis Ripmo is the other) and will keep whichever doesn’t sell. All factory specs and geo can be found here: https://www.giant-bicycles.com/us/bikes-trance-29 This bike retails for $3,100 plus tax not inclusive of the modifications made for better performance as detailed below. This bike is RAD. Do not let the travel fool you, it is a masher. It punches well above the 130/115 travel numbers with 17.1 inch chainstays and a 66.5 head angle. Aside from how slack it is, the rest of the geometry is more conservative and, frankly, a relief from the super-long reach thing that’s happening today. This is a bike you can get on and ride any trail with no fear. You don’t need to think so much about weighting the front tire as you do with longer bikes. In fact, this rig drops into a turn likes no other bike I’ve ridden. It’s really good. If you’re a taller guy looking for a short- to mid-travel 29er, you should check this out. It absolutely destroys everything else I’ve ridden in this category. The only thing even in the ballpark is the Banshee Phantom, which is heavier and less plush. I bought this bike new in late February. It has 115 miles on it. That includes multiple Hawes loops, multiple times up and down National, even runs down Corona de Loma, Devastator and Holbert (for the record, it’s probably not quite enough bike for Holbert, but I did PR on CDL and wasn't far off on Devastator). Changes from the stock build as found on the above link: Complete new Eagle GX drivetrain (significant weight reduction from the stock NX). Stock wheels are pretty nice, but had a SRAM 900 hub laced into the rear by Peter at Rage Cycles. OneUp 170mm dropper post with Wolftooth lever, WTB Silverado Ti rail saddle, Wolftooth seat clamp. Race Face SixC carbon bars, 820mm wide, 35mm clamp (these are super-wide). DMR 50mm stem with some rise, Deity Knuckleduster grips. Wolftooth headset spacers. I can swap different stem bars if you need less width, more rise, etc. Continental Trail King 2.4 front tire and Bontrager SE4 rear tire, both tubeless. Can swap DHF 2.5 front tire if you wish. Hope Tech 3 E4 brakeset with Hope 180/180 rotors. Best brakes on the market, but expensive. If you need a cheaper price, I can swap back to the stock Guides. King bottle cage. XT pedals. Bike is in great shape. On the first ride, the wind tipped it over as I was taking a photo and scraped the non-drive side of the seat tube. It’s just paint damage and I’d say that’s the weakest link of the bike is the really soft paint. $3,200 as it sits. No trades. Bike is located in Central Phoenix, Arizona. Very, very strong preference for local purchase as I am not interested in breaking down and boxing. If you're not local to Phoenix, you probably have a friend or family member who is (this time of year, half of the American population seem stop be here in Arizona). Or, we have a ton of great bike shops. You can coordinate with one of your choosing to inspect, box and ship the bike to you. I will gladly drive the bike to the shop of your choosing and drop it off. Willing to sell frameset or frame/fork combo. Thanks for reading. 2018 Ibis Ripmo GX build, size XL. Purchased new by me in September 2018, so about six months of use. It did get most of my mileage during that time, but there was always a second (or third) bike in the mix. This bike is in great condition, with the normal sort of mild scratching and rock strikes you get on a bike that spends a significant amount of time on South Mountain in Phoenix. Fitment: I’m 6’2, 34 inseam, +2 ape index. This bike fits perfectly. This is a truly a do-it-all bike and the best overall rig I’ve ever owned. It pedals incredibly well, lightweight and a descending beast. I’m moving down to one bike for the time being and hoping to get rolling on a Sprinter van project. The stock GX build, assuming you can find one in stock, is $5,100 Frame: 2018 Ibis Ripmo full carbon frame, size XL, 145mm travel, Boost. Couple minor rock dings and paint scratches. Shock: Fox DPX2 performance, 210x55. Fork: Rockshox Lyrik RC3, 160mm travel, 51 offset, Boost. Wheels: Stans Flow S1, 29mm internal, Boost. XD driver. Rear hub has new axle, bearings and complete XD freehub. Normal scratching, but no dents or flat spots. Tires: Maxxis DHF 29x2.5 Exo TR. Bontrager SE4 29x2.4, both tubeless. Extra 2.5 DHF included. Headset: Works -1 angleset (1 degree slacker, which was probably the best mod I did for this bike). Cockpit: Race Face Aeffect 50mm stem, 35mm clamp. Renthal 35mm Fat Bars, 800mm, 30mm rise. ODI AIRE grips. Bling Wolftooth headset spacers. Drivetrain: Complete GX Eagle 12-speed drivetrain. Older Race Face Next SL carbon cranks, 30-tooth Absolute Black oval chain ring, Absolute Black chain guide, XT M8000 clipless pedals. Brakes: New 2019 Sram Guide T, freshly bled, 180/180 Centerline rotors. Seating: 9.8 Fall Line dropper, 175mm with Wolf Tooth lever. WTB Silverado saddle. Extras: Spare 2.5 DHF front tire, 32-tooth RF Cinch chain ring, Specialized Z bottle cage, includes XT pedals. This is an incredible bicycle, truly a quiver killer. $4,200. Bike is located in Central Phoenix, Arizona. Very, very strong preference for local purchase as I am not interested in breaking down and boxing. If you're not local to Phoenix, you probably have a friend or family member who is (this time of year, half of the American population seem stop be here in Arizona). Or, we have a ton of great bike shops. You can coordinate with one of your choosing to inspect, box and ship the bike to you. I will gladly drive the bike to the shop of your choosing and drop it off. Thanks for reading. Newest version of the infamous Canfield Bros. Nimble 9 hardtail, 2018, Boost version. Size XL, sparkle blue, really nice steel quality. Includes tapered Cane Creek 40 headset and gold Salsa Liplock collar. Ridden less than 60 miles in a desert environment. Couple tiny rock chips and some slight paint marring on the dropout bolts from running SS. Photos obviously show a complete build, which is also available. If you would like to include any of the shown parts as a package deal, I'm happy to discuss. The listed price is frame/headset/collar, PP fees and Bike Flights shipping included in CONUS. Will ship in original box. If you're looking for a do-everything, modern slack hardtail with a super-nice build, this is for you. Freshly built 2018 Canfield Nimble 9 steel hardtail, very modern geometry, slack head angle, short adjustable rear, steep seat angle. Canfield Bros. also got the steel dialed on this newest Boost model; it’s much more forgiving than previous versions of the N9. 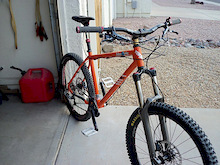 This is a very nicely built rig that can go double-duty as a geared or single-speed bike and you’ll get both setups. It’s an XL frame and has less than 60 miles on it. For sizing, I’m 6’2, 34 cycling inseam and a +2 ape index. Frame: Newest 2018 Boost version of the Canfield Nimble 9 steel frame, size XL, sparkle blue with adjustable drops, threaded BB, 44mm head tube, huge tire clearance. King bottle cage included. Fork: 2018 Fox 36 Performance series, Grip damper, 44 offset, reduced to 140 travel. Does include 160 airshaft. Has Wolftooth bolt-on axle as well as stock axle. Small ding on left stanchion that was professionally sanded and sealed by Rage Cycles. Headset: Cane Creek 40 Wheelset: Ibis 938 wide aluminum wheelset, XD driver, 6-bolt disc, 34mm internal width. Tires: Front Bontrager XR 4 29x2.6; rear Bontrager SE4 29x2.6, both tubeless (love these tires). Cockpit: Renthal Fatbars 35mm clamp, 800 wide. Renthal Apex stem 40mm for 35 clamp. Deity Knuckleduster grips, bling Wolftooth headset spacers. Seating: WTB Silverado Ti saddle, OneUp 170mm internal dropper with Wolftooth lever, Salsa Liplock clamp Brakes: Magura MT Sport brakeset with Magura 180/180 Storm rotors. Freshly bled and dialed. Drivetrain: Truvativ Dub crankset 175mm with boots, Dub 30mm threaded BB, XT clipless pedals. XO1 Eagle 12-speed setup with a 30-tooth Wolftooth ring. Also included is a Eagle X-Sync 32-tooth ring and a Problem Solvers Zinger single-speed (SS) setup allowing you to mountain a SS ring on a hub with an XD driver. Includes 18 and 20-tooth cogs as well as its own chain. This allows you to easily switch between modern Eagle gearing as well as a single-speed setup on the same bike and wheelset. $2,200 cash, complete as outlined above with pedals and bottle cage. Bike is clean and ready to roll; I can take any photos you desire or come take it for a spin in Central Phoenix. I may consider parting if you buy frame or frame/fork. Strong preference for local Phoenix sale. If you’re outside Phoenix, have a friend come do the transaction or find a bike shop you trust and I’ll drop it off there. If you have a trade to offer, make sure it's a modern full-suspension rig and size XL. Thanks for reading. PM to make arrangements to come see.